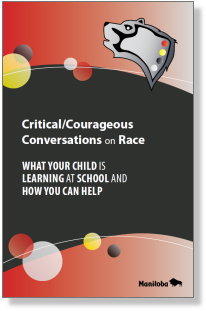 This document is a parent companion to Creating Racism-Free Schools through Critical/Courageous Conversations on Race. These documents are aimed at promoting school divisions, schools, teachers, parents and students to undertake critical and courageous conversations on racism to create inclusive and equitable classrooms and schools for First Nation Métis Inuit students and all students. It provides a vision of how parents and grandparents can help prepare their children to meet the challenges of an increasingly diverse society while creating local and international communities characterized by diversity, justice and equality.